Connecticut’s shoreline along Long Island Sound is dotted with lighthouses, from Greenwich to Stonington. While some are open to the public, most are best viewed by boat or from the shore. Luckily for lighthouse aficionados, there are several organizations in Connecticut that put on lighthouse cruises to give a closer look at the beacons that welcome ships to our shores. The Greenwich Parks Ferry, Norwalk Seaport Association, Captain’s Cove, the Maritime Aquarium in Norwalk, Mystic Seaport and more. Click through the slideshow above to see some local houses and scroll down for information on even more Connecticut lighthouses. Unless otherwise noted, these lighthouses are not open to the public for tours and are best viewed by boat. Great Captain’s Island, located 1.5 miles off the coast of Greenwich, has a rich, storied history. “Captain” reportedly refers to Captain Daniel Patrick, Greenwich’s first military commander. Both New York and Connecticut claimed ownership of the island until 1879, when jurisdiction was officially awarded to Connecticut. The lighthouse on Great Captain’s Island was first built as a wooden structure in 1829, and was later replaced by a handsome stone structure in 1868. Today, the island is open to the public and accessible by ferry from Greenwich’s Arch Street dock in the summer. Greens Ledge Lighthouse is located off the southwest end of the Norwalk Islands. The sparkplug lighthouse was built in 1902 to replace the Sheffield Island Lighthouse. In 1990, the Greens Ledge Lighthouse was added to the National Register of Historic Places. The lighthouse is not open to the public, though it serves as the starting point for the annual Ladrigan Lighthouse Swim Race. It is best seen by boat. The Stratford Shoal Lighthouse is so far from shore that there has been debate about whether the lighthouse belonged to New York or Connecticut. It is best viewed from the decks of the Port Jefferson Ferry. Located off the coast of Guilford, the Faulkner’s Island Lighthouse is the second oldest surviving lighthouse tower in Connecticut. Built in 1802, it remains an active beacon to incoming ships and is maintained by the group Faulkner’s Light Brigade. The Lynde Point Lighthouse is known as the “Inner Light” of the pair of lighthouses built off Lynde Point near Old Saybrook. Together, the lighthouses highlight the channel at the mouth of the Connecticut River. The New London Harbor Light is the oldest surviving lighthouse in Connecticut. It is maintained and operated by the U.S. Coast Guard. It is open to the public on a limited, appointment-only basis. Call 860-447-2501 to inquire. The New London Ledge Lighthouse is supposedly haunted by the ghost of Ernie, its former keeper. Legend has it that Ernie’s wife ran away with the captain of the Block Island Ferry, driving Ernie to jump from the roof of the lighthouse. His body was never recovered, but it seems that Ernie never left Ledge Lighthouse. 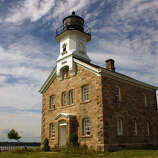 The lighthouse is maintained by the Ledge Lighthouse Foundation, which offers guided tours of the lighthouse. Call 860-445-9007 for more information. The Avery Point Lighthouse is positioned on the University of Connecticut campus at Avery Point in Groton. It was the last lighthouse to be built in the state and serves as a symbol of the U.S. Coast Guard’s duty to lighthouse keeping responsibilities. Thanks to the efforts of the Avery Point Lighthouse Society, it was relit in 2006 after being deactivated nearly 40 years prior. The grounds are open to allow an up-close view of the lighthouse. The Stonington Harbor Lighthouse marks the entrance to Stonington Harbor in Connecticut. It was first built in 1823 and now serves as Stonington’s Old Lighthouse Museum, which is open to the public.